Make 4 interest-free payments of $43.80 fortnightly and receive your order now. 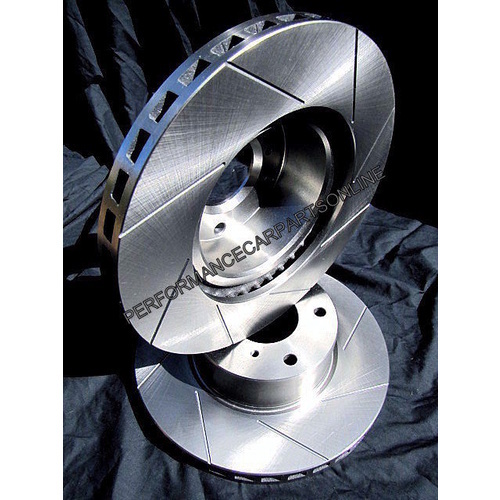 This sale is for a new pair (2 disc rotors) of Genuine Australian made VMAX™ Directional Performance Slotted Rear disc brake rotors to fit all Nissan Skyline R33 GTST GTS-T Turbo Coupe models and are a direct replacement item. 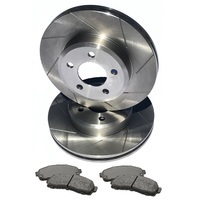 These rotors are NOT cross drilled rotors which are prone to crack, high performance rotors should never be cross drilled, they should be slotted only. 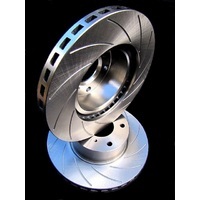 VMAX™ Rotors are Australian engineered of the highest quality high carbon content hardened cast iron, all machining is done by here in Melbourne in VMAX's Engineering Department, they are Balanced, Hardness and Runout tested and Guaranteed against manufacturing defects for a full 12m/20,000Km. 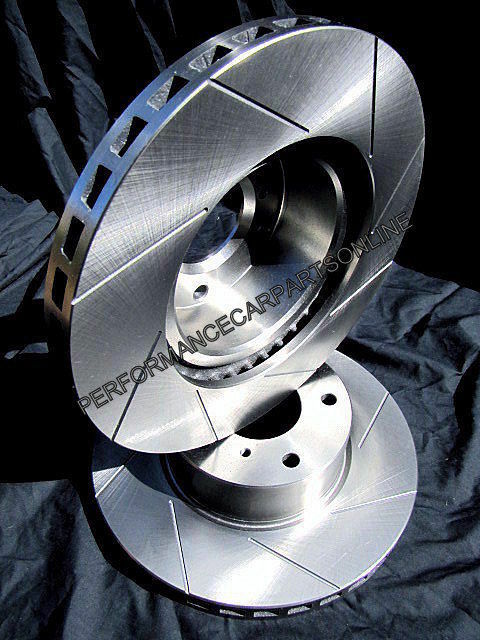 These suit Coupes only, they may not suit Sedan models as we have sometimes seen different sizes on R33 Turbo Sedans including solid rear rotors (ours are ventilated) and smaller diameters, if you have a sedan please carefully compare to the measurements provided below. 297mm Diameter, 18mm thick, 5 wheel stud holes. 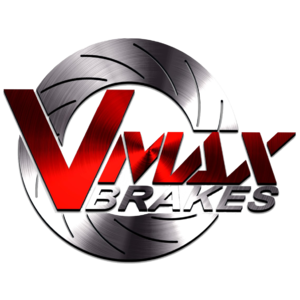 VMAX™ IS EXCLUSIVELY ONLY AVAILABLE AUSTRALIA WIDE THROUGH PERFORMANCE CAR PARTS ONLINE. *NEW Specially developed Street and Track Slots- Quicker and smoother pad bite and Immediate removal of hot gases, preventing glazing in emergency and High Performance situations giving shorter braking distances and cooler running brakes. 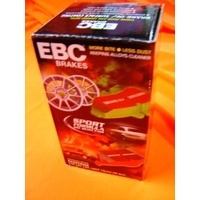 *Fully Guaranteed for 12m/20,000Km - Against manufacturing defects. *NEW each rotor is individually Rockwell hardness tested - Assuring that each rotor is to our high stringent strength standards giving longer rotor life. 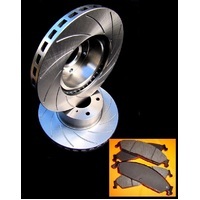 *NEW each rotor is individually checked for runout - Assuring that every rotor produced has no runout, unlike most brand name rotors that are virtually boarder line warped from new. 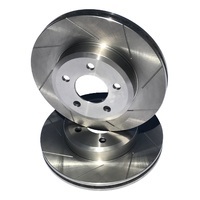 Directional rotors - Each rotor is specifically directional for maximum out gassing, cooling and shorter braking distances. 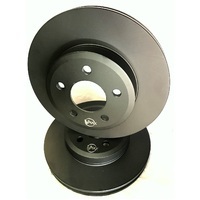 *NEW Digitally balanced rotors- For a perfect vibration free wheel balance. 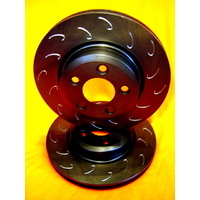 Fronts are also available, please contact us if needed. 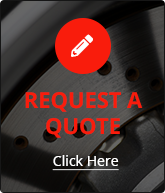 All VMAX™ Brake products are covered under a extensive 12 months 20,000 Km replacement warranty against manufacturing defects when fitted as per instructions and warranty papers supplied. Copyright notice; All information and pictures on this page are the property of Stefkovic Pty Ltd and VMAX™ 2016 and may not be distributed or commercially exploited, copied, reproduced fully or partially in any way. Make 4 interest-free payments of $69.00 fortnightly and receive your order now. Make 4 interest-free payments of $44.00 fortnightly and receive your order now. Make 4 interest-free payments of $47.40 fortnightly and receive your order now. Make 4 interest-free payments of $43.20 fortnightly and receive your order now. Make 4 interest-free payments of $67.80 fortnightly and receive your order now. Make 4 interest-free payments of $33.30 fortnightly and receive your order now. Make 4 interest-free payments of $55.80 fortnightly and receive your order now.